On the way from Thessaloniki to Igoumenitsa, Greece. All photos by author. 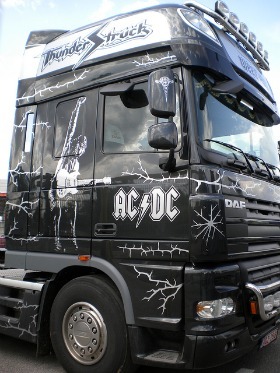 Fancy trucking equipment around the world for the gods and goddesses of Rock? Here’s what you need to know! Today’s How’d You Get That Gig? 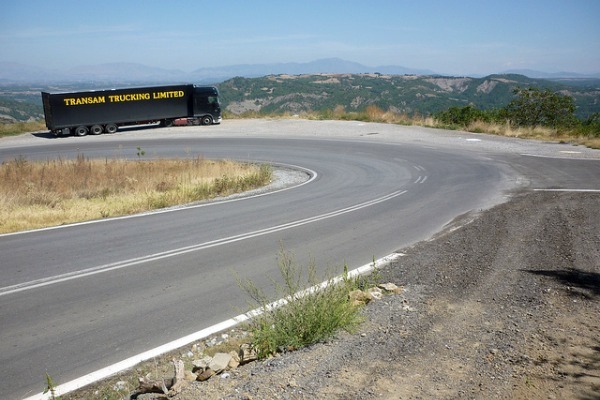 is a Q&A with British long distance rock and roll truck driver, Barnaby Davies. So what is a long distance rock and roll truck driver? We’re the guys (and sometimes gals) that get a band’s equipment from A to B when they are on tour. And believe me, if you’re working for someone like U2, that’s a lot of gear! As well as U2, I’ve been lucky enough to tour with acts such as Madonna, Paul McCartney, Bon Jovi, Depeche Mode, and Tina Turner. Contrary to popular belief, rock and roll truckers are not really roadies. We don’t get involved with setting up the stage or any of the equipment – we just drive between the shows. But we are responsible for the gear while it’s in transit, so we need to supervise the loading and unloading. You really don’t want to arrive at the next show with Bono’s lights all busted! It must be a fantastic job for travel? When negotiating rush hour traffic in Milan, you don’t want to be thinking about which of the sixteen gears to engage! Definitely! I’ve toured all around Europe: north to Finland and Norway, east to Moscow and St Petersburg, south to Istanbul and Portugal, and west to Cork, Ireland. It’s a great way to see loads of European cities, especially the capitals. But it’s not a holiday – the job has to come first. There will be occasions when you’re in, say, Berlin, or Barcelona, but you haven’t got time to get out and about. But the same cities come up all the time, so there will always be another chance to explore. You will sometimes feel sluggish and sleep-deprived, and it’s all too easy to hang around the gig, drinking endless cups of free coffee and chilling out with colleagues. But at other times, you’ll feel fresh after the 24-hour ferry from Italy to Greece, with only a three hour drive ahead of you and the prospect of two days off in Athens. Unfortunately, I don’t get to go outside Europe. When a tour continues round the world, the lighting, sound, video technicians and other crew stick with it, but drivers stay over here. We simply swap onto another tour instead. Touring the US would be possible, but only if you have the elusive work permit. What are the other advantages? And the downsides? Other than travel, the obvious pro is that you’ll see some great shows, and maybe even get to watch your favorite band. Though by the twentieth show of a tour, the novelty may start to wear off. You’ll also meet a lot of interesting people, many of whom have drifted into the industry from avenues other than trucking. On the minus side, you’re upsetting your body clock for long periods of time. And you can’t call in sick. It’s no good saying you’ve got tummy ache after dinner – nobody can fly out to Zurich and replace you for the overnight drive to Munich. And you’ll be sleeping in a truck. But you’ll get used to that – it’s just like camping, and there are always showers and toilets available at the venues. What skills, training, and qualifications do you need? You do need an HGV licence. There’s no way round that, and they aren’t cheap. I guess you’d be looking at around £1500 – assuming you pass the test first time – but it could be more by now. But nowadays, you can’t go straight for Class 1, the articulated maximum weight vehicles. You have to go through training on smaller trucks first, pass tests on them and then work your way up to the big ones. Having said that, there is work for 7.5-ton trucks on tours (small club gigs rather than stadiums) and also for 17-ton rigid trucks. You also need to apply for a digicard – a digital, credit card-style replacement for the analogue tachograph (a system that records speed and distance in a truck). And from the age of 45, you need to pass a medical every five years to retain your licence. Finally, you need a Driver CPC, which also needs renewing every five years. There’s currently a lot of confusion about this, so if you’re serious about getting a licence, your training station will furnish you with the latest developments. More than anything else, you need lots of driving experience – when negotiating rush hour traffic in Milan, you don’t want to be thinking about which of the sixteen gears to engage!